Since then updates MSQRD have come to Android with an eyedropper. sometimes añadiendo few masks, other removing them. The user experience is a little bittersweet, because developers have not been able to add faster than it takes to get bored of existing masks. Now in MSQRD masks are shown in two classifications: favorite and catalog. Favourite already downloaded and ready to use quickly, while the catalog can be downloaded or not. In any case, Eight subcategories easily downloaded with a single tap . 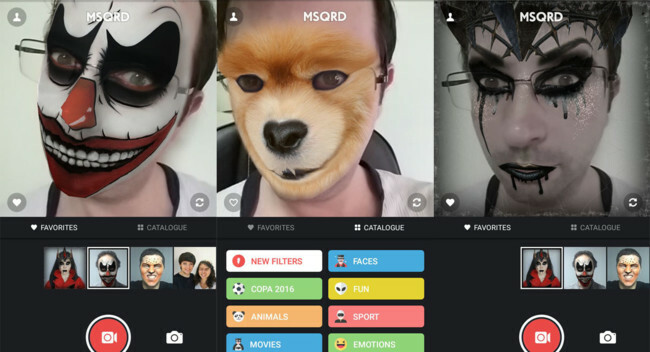 as new filters, MSQRD introduces a sort of sinister evil witch and murderer clown. These filters are directly included in the favorites, so it will not cost you find them. on the other hand, the virtual support for 16 football teams participating in the America’s Cup included. In this case the masks are not too inspired, because they are basically get the flag in the face, but still easier than pintártela really. The news MSQRD gets gothic, he added masks football and expected “store” was originally published in Engadget Android by Ivan Ramirez .